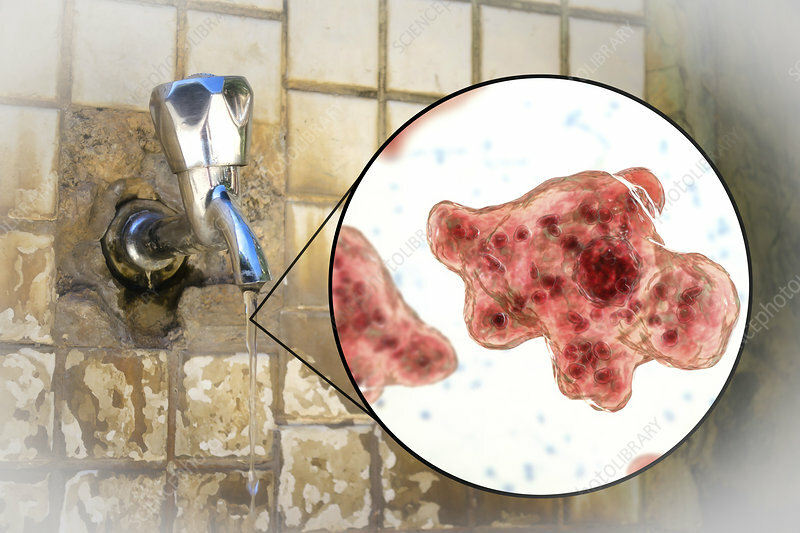 Tap water contaminated with the brain-eating amoeba Naegleria fowleri, computer illustration and photo. This organism is an opportunistic pathogen of humans, causing meningoencephalitis (inflammation of the brain and its surrounding membranes) when inhaled, often by children swimming in fresh water. Another way of transmission is ritual nasal rinsing present in different cultures, in case of tap water contaminated with Naegleria. Headaches, vomiting, sensory disturbance and a fatal coma may occur if the victim is not treated. Treatment is with antiprotozoal drugs. Infectious stage for humans are trophozoites, shown here, and flagellate forms.